Subaru Telescope atop a red cinder cone with one of the Keck domes to the right. Another view of the telescope building. Subaru Control Building with Keck Dome behind. The tall Subaru Telescope enclosured. 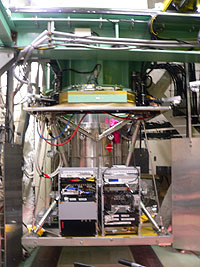 The secondary mirror is moved into position. A worker carefully watches as the secondary mirror is slowly moved. Telescope support structures and plumbing. Close-up of rails that rotate the dome. 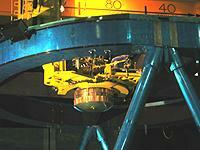 A telescope instrument receives routine maintanence. 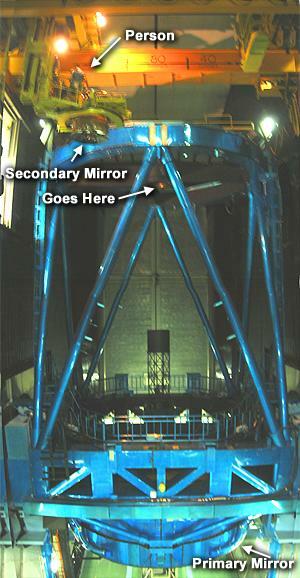 Adaptive Optics base below the primary mirror. Base Facility from the front. 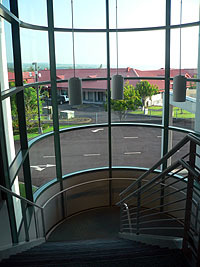 The curved staircase offers a view of the bay, Mauna Kea and surrounding astronomy buildings. 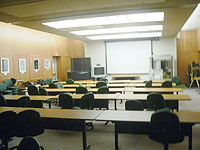 Conference rooms with telecommunication capability. 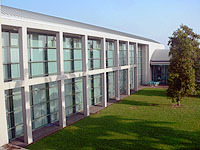 Grassy courtyard is in the front. Super computer facility assists, among other things, in summit weather preditiction. 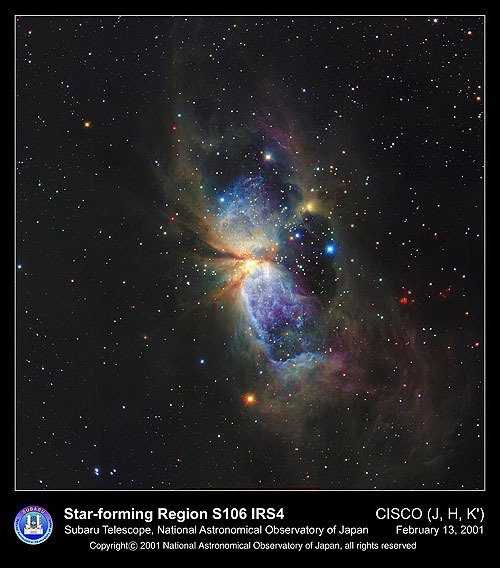 Subaru Telescope has graciously allowed us a fantastic opportunity to document their facilities and work, as well as share some images that have been taken with their telescope. 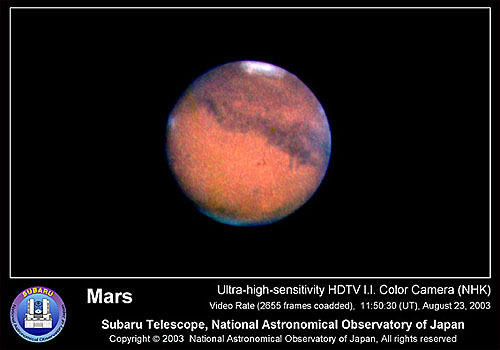 Any pictures on this page showing images of space are © Copyright Subaru/NAOJ and used by us with permission. 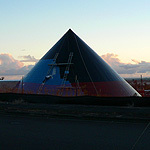 All pictures of the facility and telescope are © Copyright InstantHawaii. The first question that most often comes to peoples mind is why is a car company involved with telescopes? 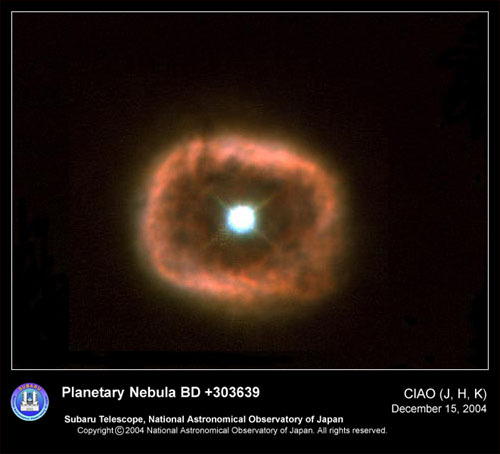 The answer, which usually results in an "oh really" response, is that the Subaru Telescope Project is not owned by Subaru Automobile but rather the Japanese Government through NAOJ, the National Astronomical Observatory of Japan which is headquartered at Mitaka. The confusion comes from the word Subaru, which is the Japanese word for the star cluster known as the Pleiades. The car company sharing the name also uses the star cluster as the logo on their line of cars. Construction on Subaru Telescope at the top of Mauna Kea started in 1991 and experienced first light (the first time the telescope is used to view a real target) in 1999. 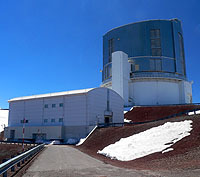 Subaru is not just any telescope; it is one of the largest optical telescopes in the world. The telescopes primary mirror is 27 feet in diameter, 8 inches thick, and weights a whopping 23 tons, making it the single largest piece of optical glass in the world. This huge piece of glass is so flat that no bumps on the surface are any larger than five-thousandths the thickness of human hair! The telescope itself is over 78 feet high. To understand just how tall that is, consider that if your ceiling is 11 feet from the floor, that the telescope is as high as a 7-story building! The entire telescope sits within a building that is almost twice as big as the telescope. Join us as we begin our virtual tour of one of the world's largest optical and infrared telescopes! 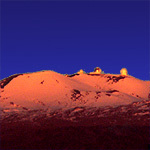 We begin our virtual tour of Subaru Telescope at 13,796 feet above sea level at the summit of Mauna Kea. For driving directions to the observatories at the summit please read our Scenic Drive To The Summit Of Mauna Kea. 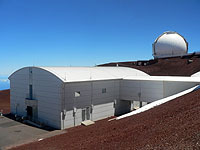 The Subaru Telescope Summit Facility is composed of two structures attached by an enclosed walkway. The first structure is the control building and the second structure is the telescope enclosure itself. Unlike telescopes of the past, people do not actually observe by looking directly through modern telescopes. Instead, all observation is done by specialized electronic instruments controlled by computers. Because of the nature of such large and complex machines just about anything at all can affect the quality of images taken by the telescope. In order to see billions of light-years into space, images are often taken over a long period of time. You can easily imagine that wind, or temperature changes could quickly ruin the ability to take quality images and this is one of the primary reasons for the two, joined, buildings. The fact is that the instruments in the telescope are so incredibly sensitive that during observation nobody is allowed in the telescope building itself, as their body heat is enough to throw off the calibration of the telescope! Furthermore, the telescope building needs to be kept at a temperature and humidity that nearly matches what is outside - so the inside of the dome, at night, is a very chilly and inhospitable place. In fact, the telescope enclosure is built on a 30 ft pier so that is it high enough off the ground to get above the natural heat layer of the rocks as they cool at night. 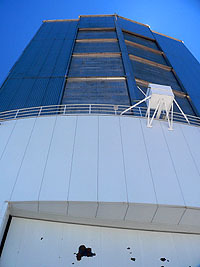 The three-story control building, attached to the telescope enclosure, is where much of the observing and telescope control take place. 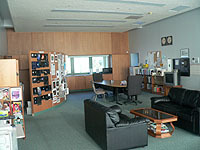 This is a much more human-friendly environment, with heat, kitchen, resting areas, and many, many computers and screens. 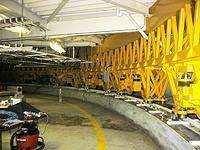 All activities within the telescope enclosure are monitored and controlled from within the control building itself. 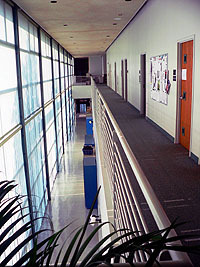 On the third story of the control building, along with the control room itself is the walkway to the telescope enclosure. One of the things that stands out, and differentiates the Subaru Telescope from many of the other telescope at the summit of Mauna Kea, is the innovative shape of the telescope enclosure. 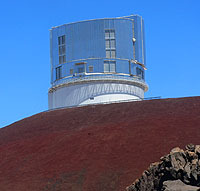 Whereas most of the other telescopes at the summit have the traditional dome, the Subaru Telescope dome is actually a cylinder with a flat roof. This innovative design was the result of many simulations to determine an efficient design that reduces the effects of wind turbulence within the building. The buildings sit, nestled, within a small volcanic cone to further reduce the effects of wind and mist. The combination of altitude and location allows Subaru Telescope to enjoy, on average, over 240 clear viewing nights per year. Welcome to Big Blue, as we'll call her for the time being. The beauty you see to the right is the actual Subaru Telescope that sits within the telescope enclosure at the summit of Mauna Kea. This 78 foot high behemoth contains all the optics and electronics needed to capture the images requested by the scientists. It is nearly impossible to take a good photograph of the telescope without special lenses. The image we show here required four photographs to be stitched together (thus you can see distortion in various parts of the picture). This telescope is HUGE! Looking near the upper left of the photograph you can see an elevated crane, known as the Top Unit Exchanger, with a small mirror under it. Just to the upper left of the mirror is a person in the Exchanger. There are actually two people in the Exchanger and the second person is lying down in order to accurately guide the Exchanger into the proper position. 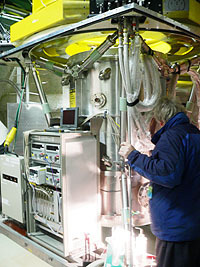 In the picture here the Exchanger is moving the secondary mirror into position to be fitted into the top of the telescope. At the bottom of the picture is the huge 27 foot in diameter primary mirror. Light enters the top of the telescope and is guided down to the primary mirror which bounces and focuses the light back to the top to the smaller secondary mirror which in turn bounces it back down to a small hole in the middle of the primary mirror. The entire telescope, shown here, sits on a layer of hydrostatic oil that is kept at a pressure of 10,000 PSI (pounds per square inch). At that enormous pressure the liquid layer is only the thickness of a human hair yet provides a nearly-friction free surface for the telescope to sit upon. 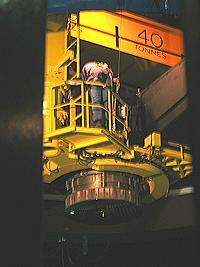 In fact, the hydrostatic layer is so friction free that it is possible to move the entire 555 ton telescope by hand! The telescope enclosure dome as well as the telescope mount (what the telescope is mounted to, including the layer of hydrostatic oil), of course move - which enable the astronomers to turn the scope 360°. Even though the dome and telescope mounts move independently, they are never more than 1/2 a millimeter apart - an amazing amount of precision for such a huge structure in that it perfectly maintains the rotational position of a 555 ton telescope and the 2000 ton dome, all at speeds of up to a half degree per second! What is responsible for moving a total of 2555 tons of metal and glass with such precisions? A look at the second floor of the telescope enclosure gives us the answer. The first floor and lower half of the second floor of the enclosure will not rotate. 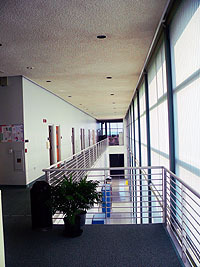 The second floor is physically separated, near the floor, all the way around with the top half resting on large wheels that sit on huge rails on the bottom half. 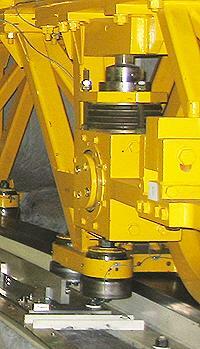 Resembling a large, circular train track it is these wheels that move the entire structure. The computers that control the position of the telescope determine where the dome is oriented by reading a bar code that is on the floor, as the dome rotates. If, at any time, the dome rotates more than 1/2 millimeter different than the telescope itself, the entire operation stops until the dome is once again realigned. 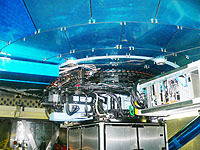 The first, or lowest floor of the telescope enclosure contains all the machines, which maintain the quality of the mirror. You can imagine that over days, weeks, and months, exposing the mirror to the atmosphere during nightly observations can cause dirt, moisture and contaminates to gather on the mirror. In order to guarantee pristine viewing the mirror is periodically removed from the telescope and lowered, using cranes, through huge mirror-sized holes in the floors to the lowest floor where the mirror is cleaned with dry ice (roughly every two weeks). Also housed in this lowest floor are the facilities for re-aluminizing the mirror coating onto the glass - which happens about every two years. Needless to say that removing, lowering, washing, and drying a 23 ton single piece of glass is a very precise operation. The telescope itself can be positioned anywhere from pointing straight up to as low as 10° to 15° from the horizon. 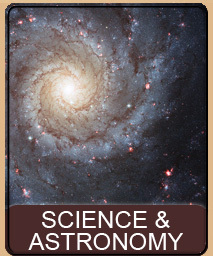 It offers a comprehensive view of just about the entire heavens. 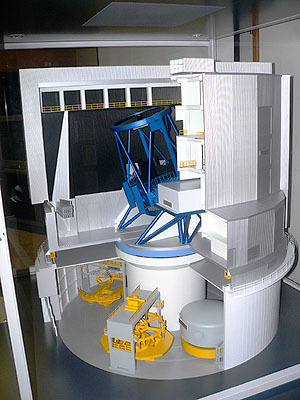 Subaru Telescope utilizes an Azimuth drive (as opposed to an Equatorial Drive) and uses computers to compensate for rotation of the Earth and the orbits of planets. This also allows the telescope to view non-star objects such as comets, planets, and asteroids. You can imagine that shifting a 555 ton telescope from nearly horizontal to fully upright causes some pretty significant stress on not only the enclosure, but also on the 23 ton mirror. Indeed, the actual shape of the mirror distorts, due to gravity and positioning, as the mirror is rotated. To compensate for this the mirror is backed by 261 robotic fingers that rest in holes in the back of the mirror. These robotic fingers are used to constantly place and relieve pressure on various parts of the mirror in order to keep the mirror distortion free. This process is known as Active Optics. Astronomy is a very progressive field with new breakthroughs occurring all the time. In the effort to peer ever farther into the past (by seeing as far as possible into space) new advances are constantly being made to keep the telescopes at the cutting edge of space science. Anyone who has ever glanced at the night-sky certainly notices that stars twinkle. Being at the top of Mauna Kea, above 40% of the atmosphere, the stars twinkle much less, but twinkle they still do. Star twinkle is caused by a number of factors including changes in the atmosphere, dust, and moisture. Any atmospheric disturbances that cause twinkling also, as you can imagine, destroy the ability to view images deep in space. In order to compensate for this, modern telescopes employ a new technology known as Adaptive Optics. To make Adaptive Optics work, a guide star is selected (a star near, but not too near where the astronomer plans on observing). A special device watches the star and examines any distortion of the star that occurs due to the atmospheric disturbances. A real-time computer adjusts a large number of very small mirrors to bend opposite the distortion allowing the twinkle to be removed. In other words, a computer watching a specifically selected star will compensate for any distortion, instantly, as the light is entering the telescope. This technology allows for nearly distorting free images even when taking them over very long exposure times! 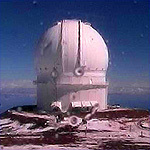 An even newer Adaptive Optic technology is now being installed and tested at a number of telescopes at the summit, including Subaru. Instead of having to rely on a guide star to determine atmospheric distortion (as there may not be a guide star bright enough, or near enough the desired observation point) these latest Adaptive Optic systems project a large, bright laser into the atmosphere to create an artificial star, which is used to remove distortion. This allows distortion to be removed regardless of where the telescope is pointing - and also provides for some interesting laser light show displays at night on the mountain, as some of these lasers, such as Sodium Ion, have bright orange or yellow beams. So if computers are doing the actual observations, and people are no longer peering directly into the telescopes, how do they actually get images? Before we answer the question above, we should examine just where, in the telescope we can actually see things. The image to the right is a model of the Subaru Telescope, used by Subaru to take to schools and other public astronomy events. We have labeled the various areas within the telescope. The best viewing is at the Prime Focus that is at the very top of the telescope where the secondary mirror is usually located. Keeping in mind that light enters the telescope where it bounces off the huge 27 foot primary mirror at the base of the telescope and is directed up and focused to the secondary mirror at the top. If we remove the secondary mirror and replace it, instead, with some type of camera, this is one of the best views as no further bouncing of the image takes place. This also gives the largest field of view of the sky that is perfect for cameras which want to look at large areas of the sky at once. If the secondary mirror is in place at the top of the telescope it reflects the light from the primary mirror back down through a hole in the middle of the primary mirror. Any camera placed under the mirror, in line with this hole can also image the sky. This is known as the Cassegrain Focus. The light that is reflected from the secondary mirror can also be diverted, just before it hits the primary mirror, to the left or right of the telescope by another mirror called the Tertiary mirror. These are called the Nasmyth Focus and on Subaru, one side is devoted to Infrared viewing and the other side is devoted to Optical viewing. There are a number of advantages to having four places on the telescope where you can view the sky. First, it allows for a number of 'cameras' to be positioned and used throughout an evening of observation merely by changing the configuration of the mirrors. Additionally, in some configurations more than one viewing area can be used simultaneously. In the section above we repeatedly refer to 'cameras' being attached to the telescope and we listed the four locations where they can be placed. The word 'camera' is quite misleading and we used it only to give a frame of reference. Subaru calls their 'cameras' instruments, and each is designed to take a different view of space. 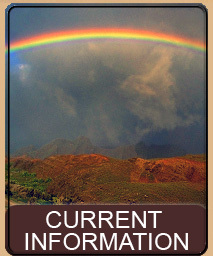 Much of the wealth of information that exists in the universe does so outside of what we consider visible light. With our eyes, even with the assistance of magnification, we see only a very small fraction of what there is to see (and hear). Viewing a distant galaxy in normal, visible light, versus Infrared light, or X-rays, or Radio waves, each give a vastly different picture. Where as a distant feature may be blocked visually with dust and gasses, other wavelengths, such as radio waves, go right though and allow us to see what is behind the dust and gas. It would not make much sense to have billions of dollars of telescopes if each just were able to take a picture in, say, visible light. It makes far more sense to make each telescope as versatile as possible. This is where the instruments come into play. The telescope itself is basically nothing more than something that can track, guide and focus light to a particular place. By itself, it cannot make any discoveries about the universe. When a scientist, somewhere in the world, has a theory about some cosmic event or celestial object they can submit a proposal to Subaru, or other observatories, outlining what they wish to view and when. 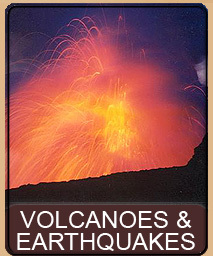 The decision as to which observatory a particular scientist would pick has to do with factors such as when the event or object will be best viewable (e.g., which part of the world), the particular wavelengths (e.g., visible, infrared, ultraviolet, radio, x-ray, etc) they are interested in, and a host of other criteria. The proposals are reviewed and either accepted or rejected. Accepted proposals are then scheduled. Subaru Telescope is an optical telescope, which means it concentrates on wavelengths from ultraviolet through visible and into infrared. It does not deal with radio waves or x-rays, which require telescopes of a totally different design. So scientists wishing to view an event in those wavelengths would book time with Subaru. They would specify which, of a number of available instruments they would need to satisfy their requirements. The instruments sit in bays off the side of the telescope. The instruments are not sitting idle, even if they are not hooked into the telescope. They must keep constant temperatures (some are super cooled) and must be constantly monitored to see if anything changes or parts fail. Any failure must be immediately addressed or it could adversely affect future viewing. Systems such as coolers often require up to 30 days to reach the desired temperature so it is very important to make sure everything is working perfectly all the time. When an instrument needs to be used it is removed from its bay and attached to the appropriate focus on the telescope. Much of this operation is robotic with human supervision. Each instrument is specialized in a different area, and new instruments are always being created. Most of the instruments are huge, often 6 feet high and just about as big around, and all contain thousands of components and sensors. What is absolutely amazing is that each instrument is totally unique - custom designed for this telescope and the only of its kind in the world. 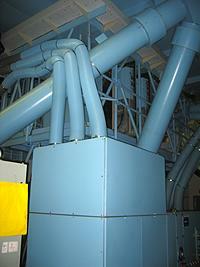 CIAO - This is a Coronagraphic Imager with Adaptive Optics and it is mounted to the Cassegrain Focus. CIAO is used to view near-infrared wavelengths, which makes it useful in detecting very faint objects near much brighter objects such as extra-solar planets orbiting distant stars. COMICS - The name of this instrument stands for Cooled Mid Infrared Camera and Spectrometer and it is attached to the Cassegrain Focus. This is one of the few instruments of its type in the world mainly due to the fact that the summit of Mauna Kea is one of the few places in the world that can receive mid-infrared light that is normally absorbed by the atmosphere. COMICS is used to study stars and star formations in galaxies. 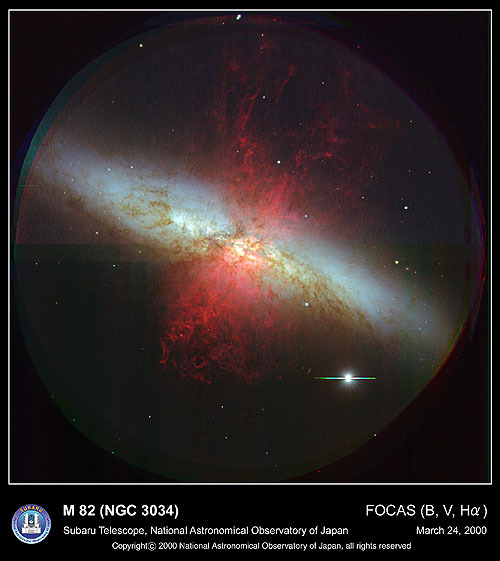 FOCAS - The Faint Object Camera And Spectrograph is used to measure distances to far away objects and can study up to 100 objects at one time. Mounted at the Cassegrain Focus this instrument is one of the primary instruments used at Subaru. 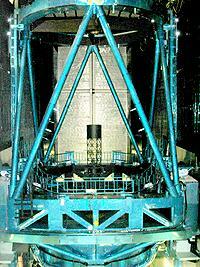 HDS - This 6-ton instrument is named the High Dispersion Spectrograph and it is mounted at the Optical Nasmyth Focus. HDS is used to study basic elements in stars and stellar gas. It is extremely sensitive to color and can split wavelengths with an accuracy of 1 part in 100,000. 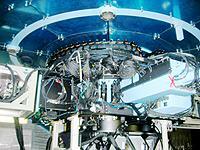 IRCS - The Infrared Camera and Spectrograph is currently attached to the Cassegrain Focus and uses Adaptive Optics. This incredibly sensitive instrument observes in the Infrared and is used to study all sorts of objects including dwarf stars, galaxies and objects exhibiting red shift. 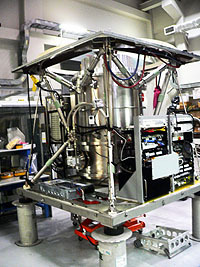 OHS - The OH-Airglow Suppressor, as this instrument is named, attaches to the Infrared Nasmyth Focus and is used to study the spectra of extremely faint objects. The term OH-Airglow refers to a natural process where near-infrared light is emitted in the Earths upper atmosphere. This naturally occurring light blocks the ability for us to observe faint objects so instruments like OHS are needed to filter out this light allowing extremely faint objects to be viewed. Suprime-Cam - The Su(baru)prime-Cam attaches to the Prime Focus (where the secondary mirror usually is) where it receives the widest possible field of view that is approximately equivalent to the diameter of the full moon. Suprime-cam is actually an extremely high-resolution digital camera. Consider that today you can go out and purchase a 5 or 6 mega pixel camera - Suprime-Cam is an whopping 80 mega pixel camera. 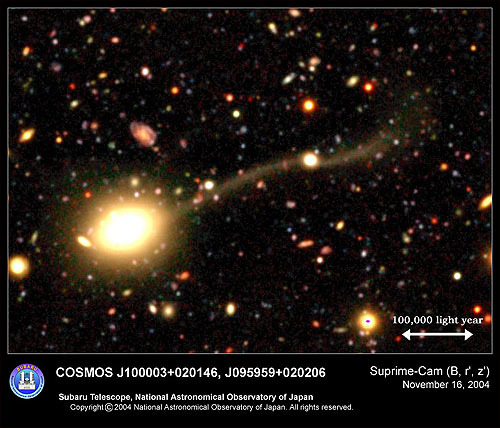 Suprime-cam is used mostly in the research of the structure of galaxies and to look deep into the universe. 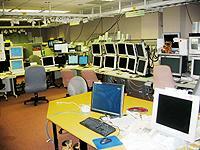 The above is just a partial list of the instruments employed by Subaru Telescope. Newer instruments with improved sensitivities and ranges as well as new capabilities are currently being tested as well as being planned for the near future. 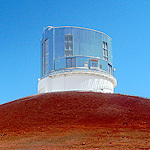 Since most optical observatories view mostly after the sun goes down, and stop viewing once the sun rises, you might assume that the summit of Mauna Kea is a hotbed of activity at night, but virtually empty during the day. In fact, however, the summit is a beehive of activity just about 24 hours a day, including weekends. During daytime hours a team of engineers, operators, and maintenance personnel, named daycrew, go to the summit to do general maintenance, improvements, and prepare for upcoming observations. Prior to sundown daycrew leaves the summit and is replaced by the night shift who are responsible for opening, operating, and closing the telescope for observations. While people go up and down daily from the Hilo Base Facility, most of the day and night crews actually live at the 9,000 foot level at the Hale Pōhaku facility. This facility is used by all the observatories to house visiting scientists and day and night crew while they have their summit shifts. 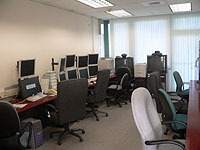 The facility has recreation, cafeteria, cable, rooms and computer labs and as such offer at least some of the comforts of home. 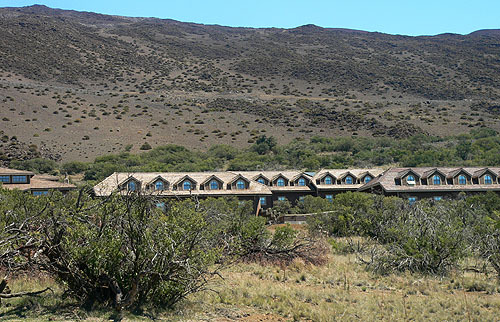 Hale Pōhaku houses the summit staff and visiting astronomers at 9,000 ft. There are many rules for working at the summit, including a maximum number of hours that can be spent at the top before they have to return to the 9,000 foot level. Crews rotate in multiple shifts so that after a few days, a crew is retired to rest before having to go up again. As you can imagine, working above 40% of the atmosphere makes just about any chore laborious. Breathing is very hard and walking, talking and breathing is extremely difficult. Very often critical decisions or design changes have to be made quickly and accurately meaning one has to be very careful at decision-making. Because life at the summit is dangerous no employees are allowed at the summit by themselves, but must always be accompanied by at least one additional person. The summit staff is trained in CPR in case of emergencies at the top. All the observatories at the summit of Mauna Kea have Base Facilities at lower altitudes on the island. It is at these facilities where most of the work is done in planning, building, programming, and even control and observation. 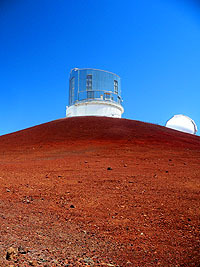 Subaru, like many of the telescopes, is a part of RCUH, the Research Corporation of the University of Hawai'i - who helps the various nations and groups involved in observatories at the summit to coordinate, hire personnel and generally maintain and plan the summit facilities and grounds. 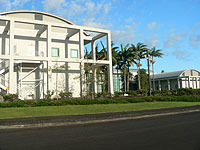 The Subaru Base Facility, along with many others, is located in Hilo behind the University of Hawai'i at Hilo where it has a breathtaking view of Hilo and Hilo Bay in the front, and Mauna Kea out the back. The Subaru Base Facility was opened in April 1997 and is a very striking and beautiful building. This facility houses the roughly 100 workers that make up the Hawai'i operations. 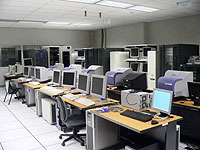 Besides office space, the Base Facility has a super computer that is used, among other things, to predict weather at the summit to determine future favorable viewing nights. The facility also has a clean room, complete electronics lab, simulation labs, a machine shop capable of fabricating just about any mechanical component, computer rooms, a technical library, and an automobile repair shop to maintain the summit vehicles. One of the more important features of the facility is a remote control room. Like many of the telescopes, viewing and operating the telescope does not have to happen just at the summit, but can also occur remotely from the Base Facility. Just about any activity that can be performed at the summit can also be performed at the base from the remote control room. However, at no time is remote viewing done without at least two staff at the summit, to deal with any emergencies or other situations that may arise. This, of course, makes complete sense given the tremendous amount invested in the unique equipment at the summit. Even though Subaru is owned by the Japanese Government and has many people from Japan working and living in Hawai'i, it employees many people from other places around the world. Besides local islanders, the facility attracts top-rate scientists, programmers, and engineers, from the mainland, the Ukraine, France, Germany and many other places making it a truly international place to work. 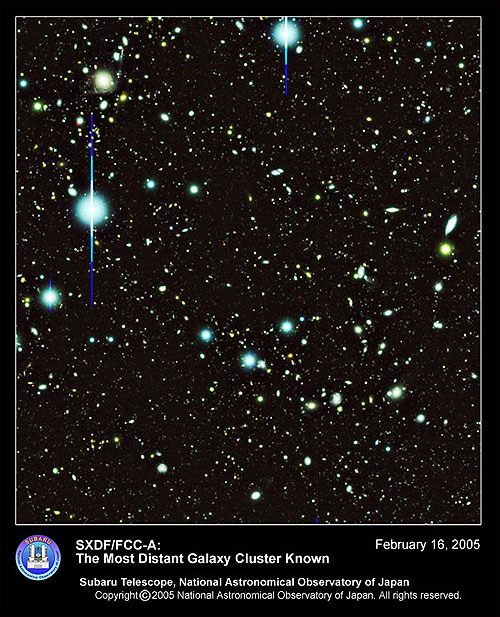 The following images were taken by Subaru Telescope. and are used here by permission. 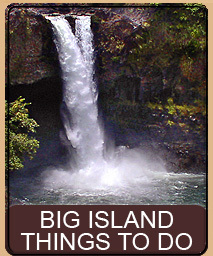 Do you live on the Big Island or are you planning a visit? 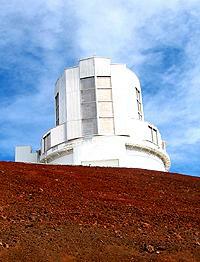 If you would like to learn more about Subaru Telescope on Mauna Kea you are in for a treat. 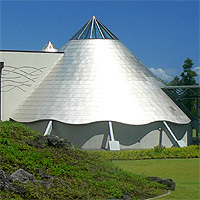 Subaru Telescope offers public tours of both the Hilo Base facility and the Summit Observatory. The Hilo Base Facility has a public Visitors Gallery that is open most weekdays (excluding state and local holidays) from 9 AM through 4 PM. There is no cost or need for a reservation. Please visit the NAOJ Visitors Gallery Page to learn more about the Visitors Gallery as well as their Holiday Schedule for days the gallery is closed. If you have a large group or school, you can arrange for a tour of the entire Hilo Base Facility: to arrange for a large group tour call Subaru at (808) 934-5056 during business hours in Hawai'i. Subaru offers tours of the Summit Facility up to 15 days each month. The 30 minute tour takes you through the actual telescope facility as well as the mirror recoating floor. This excellent tour is first class and a fantastic way to see the telescope up close. The tours are offered at 10:30 AM, 11:30 AM and 1:30 PM and are available in both English and Japanese. 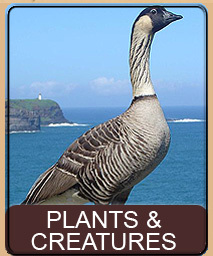 Tours are offered to groups of just about any size, including individuals so don't hesitate to make a reservation. Note that tours may be canceled due to weather or other unforeseen conditions. To make reservations for a tour of the summit facility visit the NAOJ Summit Facility Page to read more about the tour and to sign up to take the tour. 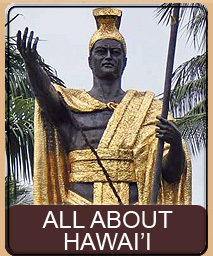 You might also want to visit our Mauna Kea Summit Scenic Drive Page which give you directions from Hilo (and Kona) to the summit along with interesting facts about the drive and warnings about being at the summit. This page is named 'Astronomy.anatomy'. Can't Find It?